A rendering of 48 Corliss Ave., Johnson City, when renovations to the former shoe box factory are complete. Gov. Andrew M. Cuomo today announced that $30 million in Upstate Revitalization Initiative (URI) funding has been awarded to Binghamton University to complete its Health Sciences Campus in Johnson City. This latest investment will finalize the nursing school building that will be housed in an historic, former Endicott Johnson shoe box factory, and co-located with the University’s new School of Pharmacy and Pharmaceutical Sciences. The University has already secured funding to renovate the first four floors of 48 Corliss, with work set to begin this spring. The URI fund will allow the University to complete renovations to floors five and six. In addition to the 48 Corliss Ave. renovations, the University will also use these URI funds to create space and facilities that can attract public and private research partners, support the creation of an eldercare facility and connect the campus to the downtown business district. “The $30 million will allow us to build, rehabilitate and equip buildings on our Health Sciences Campus and get us across the finish line,” Stenger said. In addition to this $30 million, the University has already secured $15.9 million for a research and design building to support faculty research and entrepreneurial partnerships. 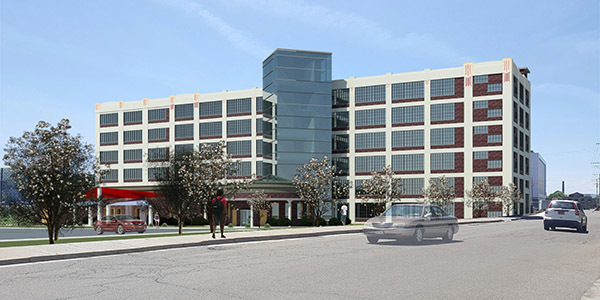 These R&D facilities will be constructed adjacent to the recently opened School of Pharmacy and Pharmaceutical Sciences and on other sites along the Corliss Avenue corridor.